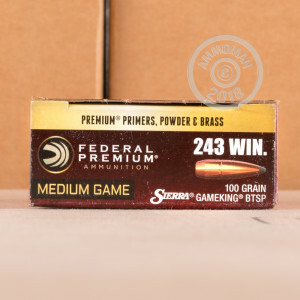 Give your .243 Winchester some serious firepower with this soft point ammunition from Federal. 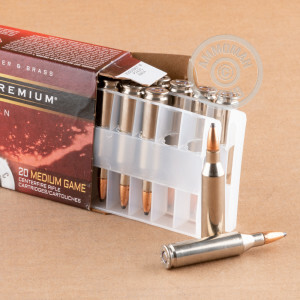 These cartridges fire a 100 grain version of Sierra's GameKing soft point bullet at a muzzle velocity of 2,960 feet per second. Take deer, coyote, and other animals with ease using Federal Power-Shok ammo! Sierra GameKing bullets are a well renowned, proven design for hunting a wide variety of game. Their boat tailed profile and high quality construction give them excellent long-range accuracy so you can make tough shots that demonstrate your true skill in the field. 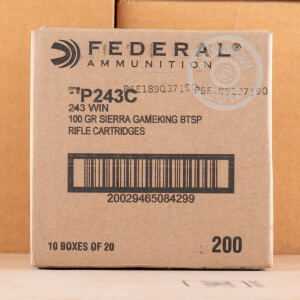 This ammo is loaded at Federal's headquarters and main production facility in Anoka, Minnesota. Like other entries in the Power-Shok series, it uses non-corrosive Boxer primers and brass cases.